The Young and the Restless Spoilers: Nikki Does Whatever It Takes for Her Family! The Young and the Restless Spoilers, Thursday, April 20th: Nikki Does Whatever It Takes for Her Family! Nikki looks out for her family in The Young and the Restless spoilers. 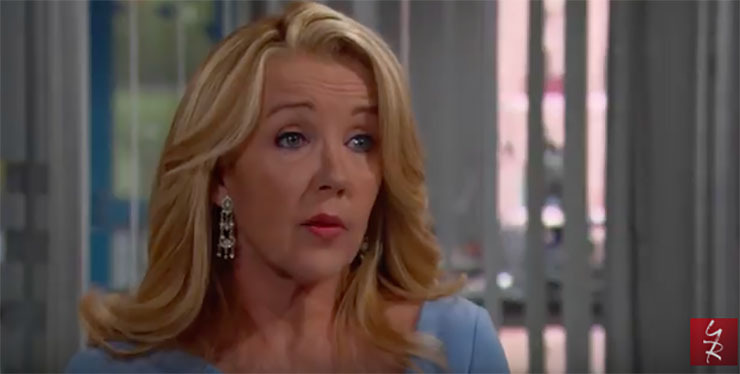 The Young and the Restless spoilers for Thursday, April 20th, predict that Nikki can be just as “resourceful” as Victor when it comes to looking out for her loved ones. When your husband is revealed to have done some dastardly deeds that you were unaware of, and you’re absolutely livid at him, but you don’t want the attention turning him into the police would bring, as Nikki (Melody Thomas Scott) is feeling these days, you may have to take steps you are not thrilled about. Thursday Nikki pulls strings to make sure her family is protected from Victor’s shenanigans. In more important news, Nikki continues to work a fabulous look while doing this. Such a great soap heroine, right, dear Soap Cities readers? Scott (Daniel Hall) wonders what Nikki’s trying to hide. Cane (Daniel Goddard) and Billy (Jason Thompson), though they are family and should probably find a way to get along, have never seen eye to eye. However, especially now that they work closely together, they do know each other pretty well. So it isn’t hard for one of them to push the other’s buttons, as they know where these buttons are. In this case, Cane sets Billy off, and the two have a confrontation. That’s what some bartenders prefer to be called these days: mixologist. And Ashley is something of a mixologist herself Thursday! She mixes business with pleasure. That’s not often a drink that goes down smoothly, but if it involves finally getting amorous with Ravi (Abhi Sinha), we’re all for it! Next Article Y&R Star Stacy Haiduk on Her First Daytime Emmy Nom and More!